STAR TREK – THE WRATH OF SPOCK! Star Trek is truly a science-fiction phenomenon. It has permeated most every facet of our society and most anyone around the world can, at the very least, recognize some part of it. Be it the Enterprise, and her large saucer section, William Shatner’s unmistakable Captain Kirk or just the pointy ears, there’s always something. Indeed, it is a merchandise machine as well, and among the earliest merchandising tools, as always with science fiction and fantasy, were comic books. 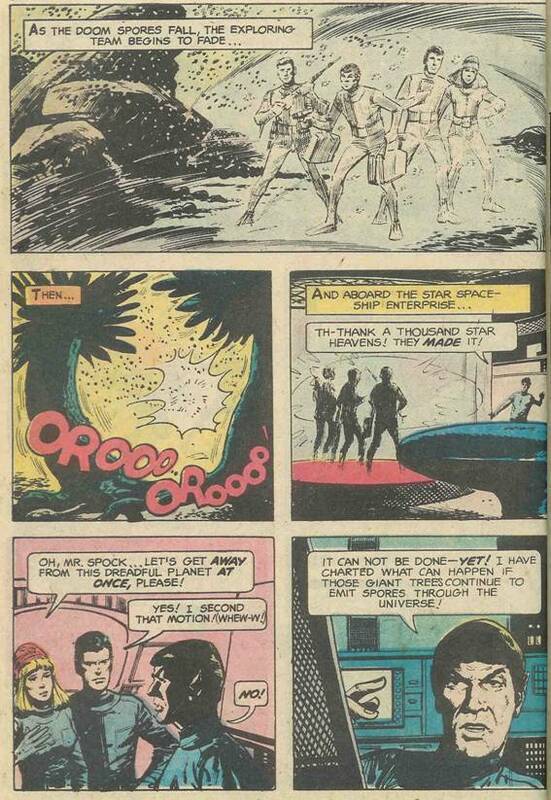 Though this is the case with Star Trek, the start of the comic book/Star Trek alliance was very rocky. Star Trek #1 was published by Gold Key/Western Publishing back in 1967. The crew of the Enterprise arrives to an unexplored planet, are assaulted on the Enterprise by a superior being (this time giant, carnivorous plants), survive and beam down to the planet to investigate, a pretty standardized beginning. Why they didn’t just turn tail and leave things be, I have no idea. I know if I ran into giant, flesh eating plants, my first instinct wouldn’t be to go looking for even more. 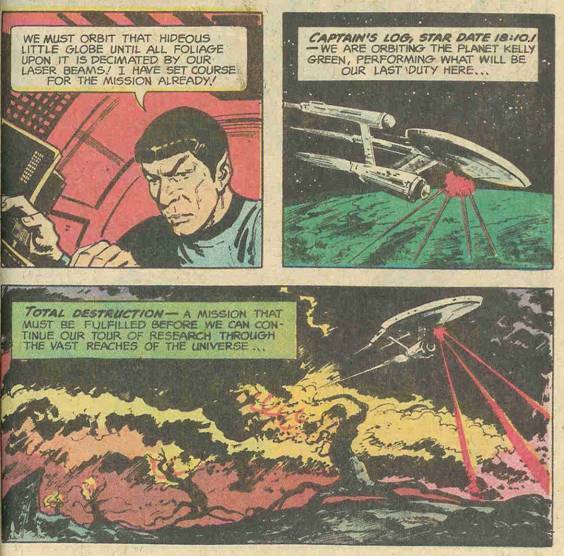 ABOVE – Select panels of Star Trek #1. Those are some pretty smart trees to create a cattle drives. And don’t let the blue jumpsuits fool you, that’s Kirk and McCoy in the bottom panel. I think the one on the left is Kirk as he’s got that paused speech balloon going, but don’t quote me on it. Of course one of the crew is captured and joins a “cattle run” to feed the trees. You know, when you think about it, the plant life is pretty smart here. They assault the Enterprise, possibly seeing it as a threat, so they are obviously aware of their surroundings. They pen animals up and raise them until it’s time to feed. They can organize themselves into functioning groups. They sound almost human, don’t they? Or at the very least, the plants remind me of the Ents from the Lord of the Ring trilogy. If this were a Jean-Luc Picard led mission, he’d probably try to reason with the plants. 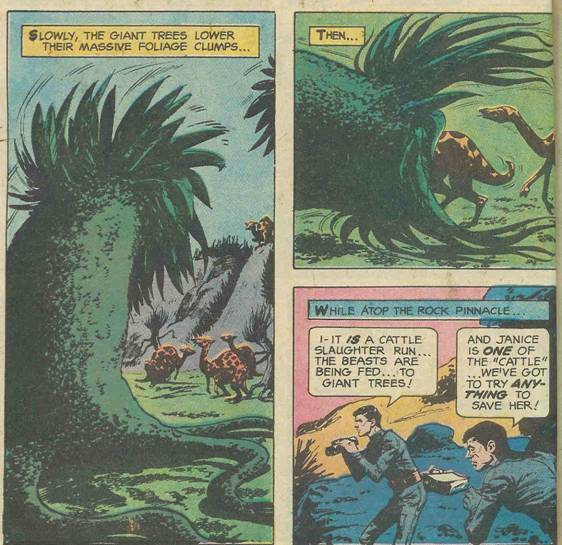 Heck, he tried it with a giant, animal (and human and plant!) devouring crystal, so why not sentient plants? However, this is a Captain Kirk led away mission, so what we get is a daring rescue and escape. Not a bad choice in terms of entertainment value. Naturally the plan works and everyone soon finds themselves aboard the relative safety of the Enterprise and are set to beat a hasty retreat. 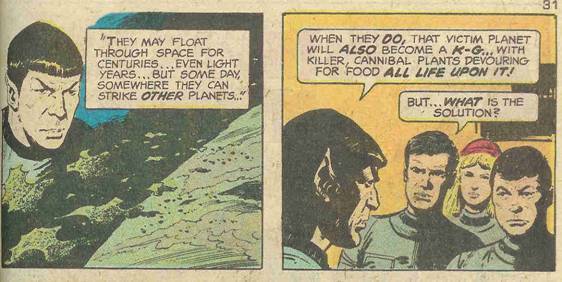 ABOVE – More select panels of Star Trek #1. A daring escape and a hasty retreat! No, wait! Spock says there’s more work to be done! Enlighten us, oh guru! So, Spock has come to the realization that if left alone, the plant life on this planet could migrate to other worlds. You mean, like what humans are doing? Shocking! Okay… uhm… that was unexpected. I could understand it if Kirk were to recommend blowing the planet to smithereens, after all, he was down on the surface, he saw the plants first hand, he would have the most emotional stress. But Spock? I don’t know, maybe as a kid he had a bad run in with a Venus Fly Trap or was pricked by a rose thorn or something. In years of watching the shows, reading the books and so on, I’ve never encountered such a radical solution actually being carried out. Kirk was notorious for violating the Prime Directive, but to waste an entire world, man, Spock has him beat by a mile! Star Trek and all related characters and stories are TM and © Paramount Productions.